Drunk on Ink is a blast interview series conducted by Soniah Kamal, Jaggery Blog Editor and author of the forthcoming novel Unmarriageable: Jane Austen’s Pride & Prejudice in Pakistan. Jamie Brenner was born and raised in suburban Philadelphia but has called New York City her home for the past twenty years. 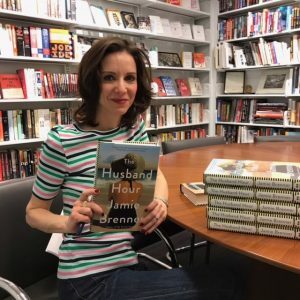 She graduated from George Washington University with a degree in literature and spent her career in publishing before becoming an author herself. 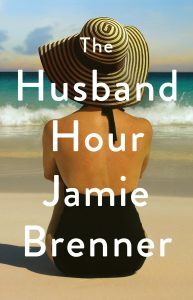 Her books include The Gin Lovers, The Wedding Sisters and her next novel, The Husband Hour, will publish in April 2018. She lives in Manhattan with her husband and two daughters. When a young widow’s reclusive life in a charming beach town is interrupted by a surprise visitor, she is forced to reckon with dark secrets about her family, her late husband, and the past she tried to leave behind. Lauren Adelman and her high school sweetheart, Rory Kincaid, are a golden couple. They marry just out of college as Rory, a star hockey player, earns a spot in the NHL. Their future could not look brighter when Rory shocks everyone-Lauren most of all-by enlisting in the U.S. Army. When Rory dies in combat, Lauren is left devastated, alone, and under unbearable public scrutiny. Seeking peace and solitude, Lauren retreats to her family’s old beach house on the Jersey Shore. But this summer she’s forced to share the house with her overbearing mother and competitive sister. Worse, a stranger making a documentary about Rory tracks her down and persuades her to give him just an hour of her time. One hour with filmmaker Matt Brio turns into a summer of revelations, surprises, and upheaval. As the days grow shorter and her grief changes shape, Lauren begins to understand the past-and to welcome the future. SONIAH KAMAL: First author/book you read/fell in love with? Why? JAMIE BRENNER: The first author I fell in love — like so many girls of my generation — was Judy Blume. There was an honesty to her characters and subject matter I’d never experienced before. It was the first time I felt books did not simply convey a story but that they were a conduit to the “real” world. To unwind: chai, coffee, water, wine? A novel, short story, poem, essay, anything you believe should be mandatory reading? Why? Henry James’ The Beast in the Jungle. Aside from his beautiful writing, there is a larger truth in there about life – like all the best literature. The story offers a warning, and I read it young enough that it stayed with me not only as piece of writing but as a cautionary tale about life choices. Any classic you wished you’d pushed through in your teens? No, I don’t regret any mandatory reading I didn’t finish. I think some – not all, some — of the Dead White Men who dominated the curriculum of the eighties were overrated. Favorite book to film? And why? I can’t believe I’ve giving two shout-outs to Henry James in the same Q&A, but I have to say one of my favorite book-to-film adaptations is The Golden Bowl with Uma Thurman and Kate Beckinsale. It just reminded me what a great soap opera that novel really was. In that same vein, I would also say The Age of Innocence starring Winona Ryder, Michelle Pfeiffer, and Daniel Day Lewis. What a cast. Asking me to pick one favorite Indie book store is like asking me to name a favorite child! Can’t do it. I’ve had such amazing experiences travelling around the past two summers visiting bookstores from Delaware to New Jersey to Cape Cod. But I will say I’m especially happy to see a new independent bookstore in my Pennsylvania hometown, Narberth Bookshop. It’s owned by a woman named Ellen Trachtenberg who went to my high school, Lower Merion. I grew up visiting a small bookstore every weekend with my father. There were a few in town and they are all long gone. I’m hoping Ellen’s store is the start of an indie revival in the area. The one think you wish you’d known about the writing life? I wish I’d known that the process of writing a novel never gets easier. With every book it’s like I’m doing it for the first time. I love cats – love. I think they are the most beautiful, intelligent creatures. Just the sight of one in a window or on the street makes my day. Unfortunately, my husband is allergic so now I have to live vicariously through cat Instagram accounts. My ideal vacation involved a beach, good restaurants, a bookstore, and ideally something that sparks an idea for my next novel. My favorite book cover is for the novel The Piano Teacher by Janice Y.K. Lee (something about the colors and the pose of the woman– just extraordinary), followed by the cover for my next novel, Drawing Home. It hasn’t been released yet but it’s a beauty! I’m a fan of Mark Rothko. As for something a little more accessible, I recently discovered a Cape Cod artist named Anne Salas and her paintings are breathtaking. Any Lit Festival anecdote you want a share? I was at the Newburyport Literary Festival about eight years ago when I was working in publishing and before I became an author myself. I met one of my all-time favorite novelists, Anita Shreve. She was so lovely and humble. I’m grateful I had the chance to meet her and I still mourn the loss of her spectacular talent. Recommend a Small Press and/or Literary Journal? My daughter just introduced me to the small press YesYes Books. They are publishing some incredible new voices in fiction, poetry – daring and unconventional. Favorite Jane Austen novel and film adaptation? My favorite Austen novel is Emma because of the heroine’s timeless rebel heart. Fav orite Jane Austen adaptation is Sense and Sensibility (1985) — the cast was just a dream: Emma Thompson, Kate Winslet, Hugh Grant, and Alan Rickman. I love that Emma Thompson wrote the script. Last impulse book buy and why? I wouldn’t call it impulse buying but when I travel to bookstores to do events I also ask the bookstore owner to recommend something and I buy the book without question, without reading the synopsis. I’ve found many gems this way. For example, a small novel called Dinner with Edward by Isabel Vincent. Never would have picked it up if it weren’t for Rita Maggio of Booktowne in Manasquan, New Jersey. Soniah Kamal is an award winning essayist and fiction writer. Her novel Unmarriageable: Pride & Prejudice in Pakistan, a parallel retelling of Pride and Prejudice and set in contemporary Pakistan, has received starred reviews from Publishers Weekly and Library Journal. NPR calls it ‘thought provoking and deliciously readable’ and People Magazine says “This inventive retelling of Pride and Prejudice charms.” Unmarriageable is an Amazon Best Books pick, a People Magazine’s Pick, a New York Post Best Book pick, a Library Reads pick and more. Soniah’s debut novel An Isolated Incident was a finalist for the Townsend Award for Fiction, the KLF French Fiction Prize, and is an Amazon Rising Star pick. Soniah’s short story ‘Jelly Beans’ was selected for the Best South Asian Short Stories Anthology 2017. Her TEDx talk is about regrets and redemption. Her work has appeared in The New York Times, The Guardian, Buzzfeed, Catapult, The Normal School, Literary Hub, and has been widely anthologized. She has an MFA in Creative Writing from Georgia State University where she was a Paul Bowles Fellow in Fiction. She currently teaches creative writing at Rhineheart University and reviews books for the Atlanta Journal Constitution. Soniah will be giving a keynote address at the Jane Austen Summer Program Conference (2019) and she is a Jane Austen Literacy Ambassador. She was born in Pakistan, grew up in England and Saudi Arabia, and currently resides in Georgia.